An incision is made in the skin below the collarbone to create a small "pocket." 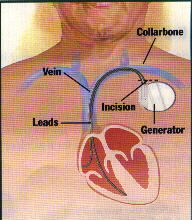 The lead is threaded through the incision into a vein in the upper chest. The lead is then guided into the heart's chambers using x-ray monitors. Electrical measurements are taken to determine a good position for the lead in the heart. If there is a second lead, this process is repeated. The pacemaker generator is attached to the lead or leads. Then, the generator is placed in the pocket under the skin. The pacemaker's settings are programmed to help the heart beat at a rate that's right for the patient. The incision is then closed and covered with a sterile dressing.